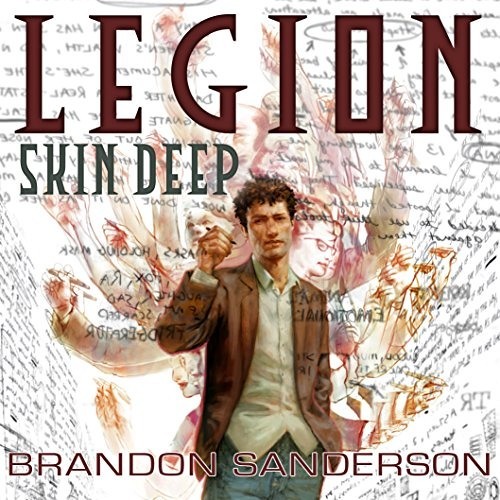 Legion: Skin Deep by Brandon Sanderson on Audible: http://www.audible.com/pd/Sci-Fi-Fantasy/Free-Legion-Skin-Deep-Audiobook/B00PHPT01I?source_code=SCLGB906SWS082913 Summary: Brandon Sanderson is one of the most significant fantasists to enter the field in a good many years. His ambitious, multi-volume epics (Mistborn, The Stormlight Archive) and his stellar continuation of Robert Jordan's Wheel of Time series have earned both critical acclaim and a substantial popular following. In Legion, a short, distinctly contemporary novella filled with suspense, humor, and an endless flow of invention, Sanderson revealed a startling new facet of his singular narrative talent. In the stunning sequel, Legion: Skin Deep, that talent is on full display. Stephen Leeds, AKA ''Legion',' is a man whose unique mental condition allows him to generate a multitude of personae: hallucinatory entities with a wide variety of personal characteristics and a vast array of highly specialized skills. As the new story begins, Leeds and his "aspects" are hired by I3 (Innovative Information Incorporated) to recover a corpse stolen from the local morgue. But there's a catch. The corpse is that of a pioneer in the field of experimental biotechnology, a man whose work concerned the use of the human body as a massive storage device. He may have embedded something in the cells of his now dead body. And that something might be dangerous... What follows is a visionary thriller about the potential uses of technology, the mysteries of the human personality, and the ancient human need to believe that death is not the end. Legion: Skin Deep is speculative fiction at its most highly developed. It reaffirms Sanderson's place as one of contemporary fiction's most intelligent - and unpredictable - voices.